One of the most popular children's / kids party entertainers & magicians in Birmingham, Bromsgrove, Kidderminster, Worcester, Stourbridge, Solihull & Wolverhampton! Ideal for birthday parties, christenings, weddings. Great for schools and nurseries were Andy's magic shows will be tailored to suit the audience. Andy has entertained at 1000's of parties with his magic shows. His unique style of colourful, face-paced, slapstick, comedy magic, fun and entertainment is always a hit with the children. He'll have the kids in fits of laughter and leave them with gasps of amazement. He always aims to make each party as memorable as possible for his audiences. Andy's Magic offers one of the best kids disco parties. Non-stop action - fun from start to finish. Kids go crazy dancing in LED and laser lights. His bubbles machine is a sure-fire winner. There's dancing competitions, action songs, pass the parcel, party games - were no one is eliminated, meaning no tears, - and kids love to try and win his fidget spinner prizes too. 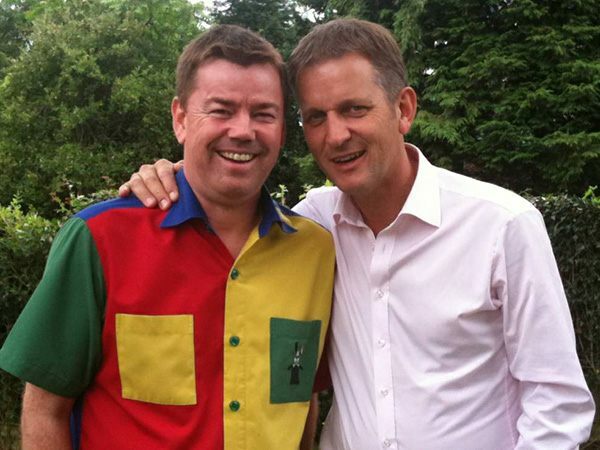 As one of the leading children's entertainers Andy strives to make his disco and magic show parties the best. Book Children's Enterainer and Magician, Andy's Magic and don't forget to invite Charlie and Max who would love to be involved in your party and magic show - call Andy now to book! Add face painting with professioinal face painter, Karla and she will magically transform the kids. 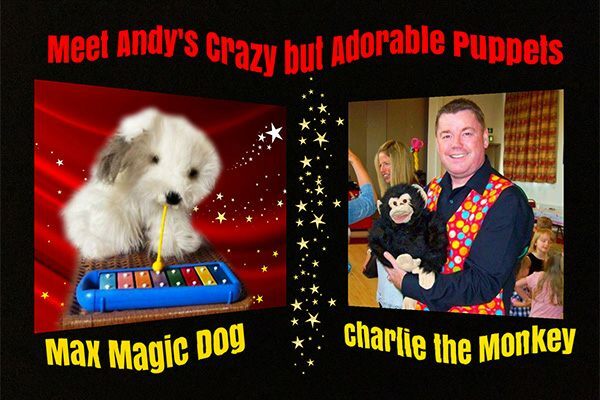 The children will love Andy's two crazy but adorable puppets, Charlie the Monkey & Max the Magic Dog (ideal for playgroups, nurseries and kids ages 2 -6 years) who will cause havoc and laughter and then delight the kids by finally producing sweets for all the kids at the party... by MAGIC! All kids love balloons and Andy will supply the best for all the children and its a great way to end the birthday party and make a complete entertainment package any child will love. Make your party hassle-free and leave everyone with magcial memories too. Check out the One Hour or Two Hour Party Packages - there's something for everyone here. Call Andy now! You're entitled to free balloon animals for 25 kids with any party package special offer or magic show package with Andy's Magic - Children's Party Entertainer & Magician. Book Andy Magic, for any children's entertainment or magic show package and you will be guaranteed peace of mind. He not only offers a quality guaranteed, professional, reliable, competitively priced entertainment service for your party but he's also fully Insured, a member of Equity, his equipment is all P.A.T tested and he's DBS Checked as well. 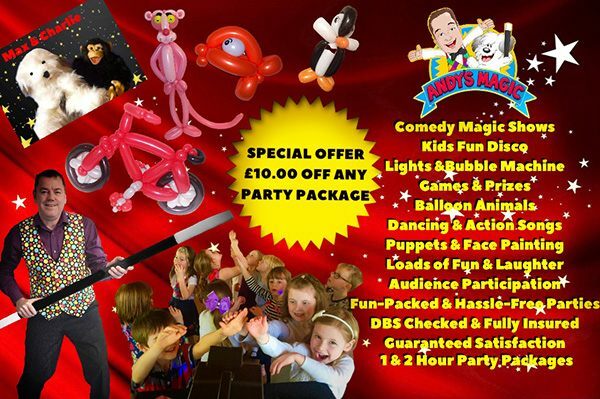 "One of the Best Children's Entertainers - Andy's Magic - ideal for weddings, christenings, birthdays, corporate, Schools, Nurseries, playgroups and private parties. A whole world of magical entertainment call now - 07976367058"
I booked Andys Magic for my wedding to keep the children entertained for a couple of hours and for close magic at the tables during the wedding breakfast. It was money well spent, I have had lots of good comments. He really made our day special.